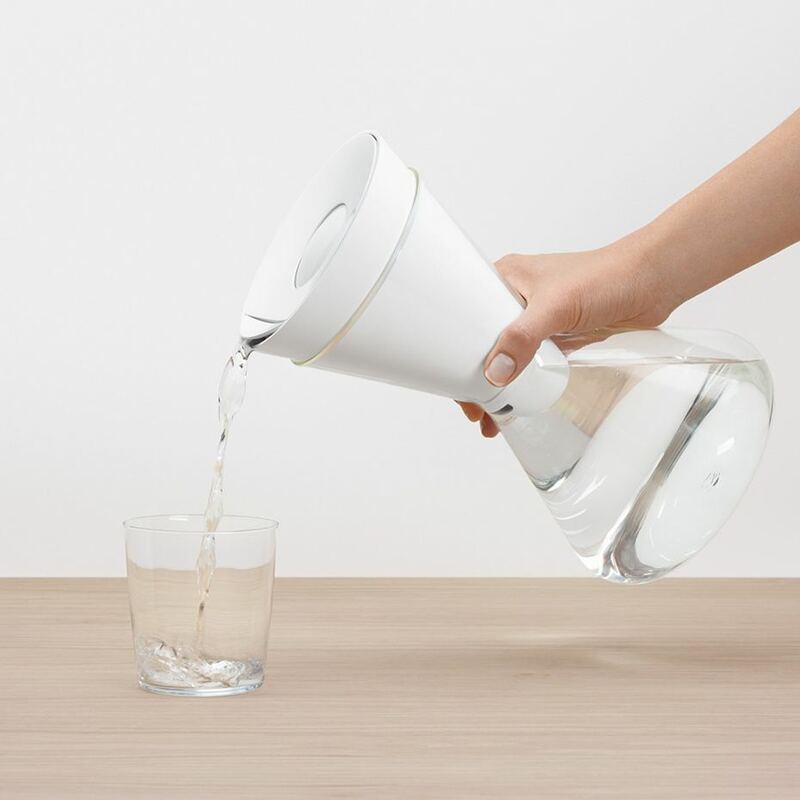 Soma created possibly the chicest water filter there ever was after being disappointed with others on the market and feeling like it wasn't an item they could leave out on their table at dinner. I'd say they succeeded on all fronts. Not only do their filters provide you with delicious water, they also donate to Charity: Water with every purchase. I ordered mine on Amazon here and the first one that arrived came with resin on the handle and scratches but Amazon replaced it immediately and the new one was fine. Why can't everyone design things as simply as Soma? The design is clean, sleek and theres no extra frill. The shatterproof plastic is BPA free and the handle is made of sturdy white oak. The filling lid door opens automatically for refilling and the new filters are very easy to install. Pouring is smooth and the lid is very firmly on there. If the pitcher isn't your thing, they also offer a carafe option which holds 48oz. Little did i know, until i watched this video, what garbage is usually in water filters and how badly they can impact the environment. The soma filter is the first of its kind and completely biodegradable. Instead of plastic resin, the water is filtered through... well, burnt coconut. Another thing i love about it is how easy it is to install when you need a fresh filter. The filters come in their own resealable bag so you can soak them right in there prior to just dropping it into the reservoir. The filters are said to last 40 gallons and you can subscribe to have your filters delivered automatically at a much cheaper price! The water tastes great (people who say all water tastes the same are just plain wrong) and i've not experienced any weird carbon flakes (a la Brita) or plastic resin (ahem, zerowater) in my drink which is always appreciated. You can read more about the filter itself here. Considering this plastic pitcher can hold 80oz of water, the construction; especially of the handle, feels very sturdy and strong. 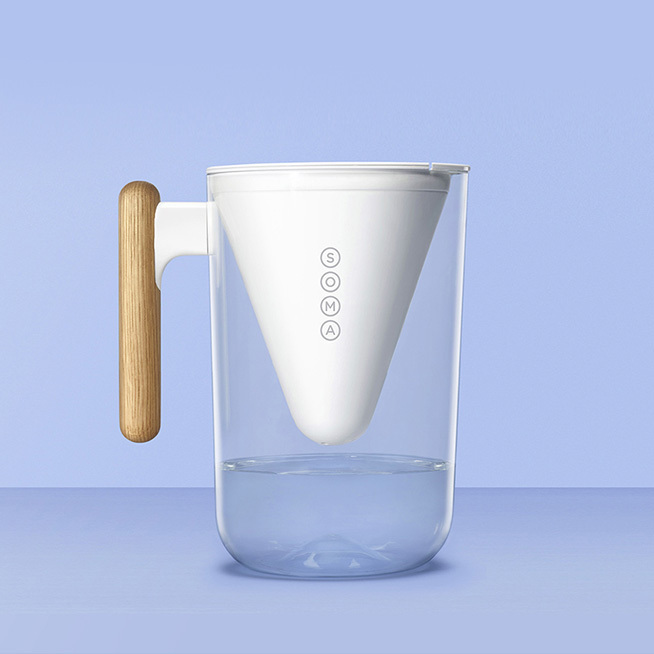 Its easy to pour and the spout doesn't drip which seems to be rare in water filters. The flap on top which allows you to fill it will flop down when you turn on the faucet by the weight of the water which generally works very well. On occasion, the flap doesn't go down and you end up with water everywhere but i'd say its about 1 in every 10 fills that it happens and since i fill over the sink its not really an issue any way. I just poke it down with my finger to start the flow when this happens and the water takes care of it from there. After filling, the filters drains FAST (better than brita or zerowater, imo) which i love since i drink so much water and hate waiting for the reservoir to drain for ages before i can top it up more. The lid clips on solidly so you don't have to hold it on when pouring- its not going to come flying off! Although i did order mine on Amazon (sometimes it works out better if you have points or an Amazon card), you can buy the pitcher and prepay for filters at a much cheaper price at their website. Buying the pitcher and prepaying for 12 filters as a bundle saves you almost $50! Soma also have a "give $10, get $10" program so if you'd like $10 off your order, you can sign up via this link.